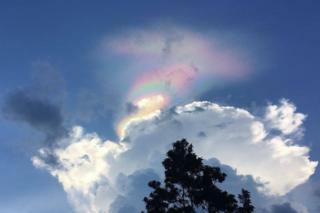 A rare cloud phenomenon over Singapore has delighted people in the city-state. The multi-coloured glow appeared in the sky on Monday in the late afternoon, lasting for about 15 minutes, and was seen across the island. Media reports said it was likely a fire rainbow, which occurs when sunlight refracts through ice-crystal clouds. Others have also said it could have been cloud iridescence, which happens when water droplets or crystals scatter light. Fazidah Mokhtar, who works in a childcare centre, told the BBC that she spotted it around 17:10 on Monday (09:10 GMT). Facebook bereavement leave: How long is long enough? "It started as a small orange circle and then grew bigger and bigger till all the colours came out... It lasted for about 15 minutes and it slowly went off. She said "all the children in the school, some parents, and other staff were very excited and commenting that it was very, very rare to see such a beautiful and unique rainbow". The phenomenon prompted jokes online, with many comparing it to a Paddle Pop, a rainbow-coloured frozen dessert popular in Australia and Asia. "The rainbow bridge is broken," joked one Facebook user, while another person asked: "Is this a case of Monday Rainbows?!"